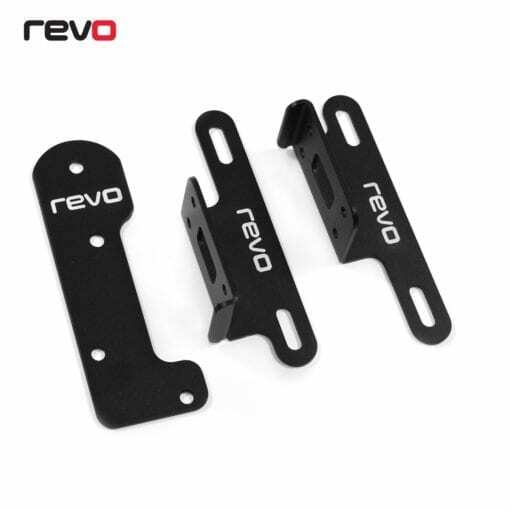 The Revo Charge Cooler System is a direct replacement kit that offers enhanced cooling capabilities to maximise the performance of your vehicle. 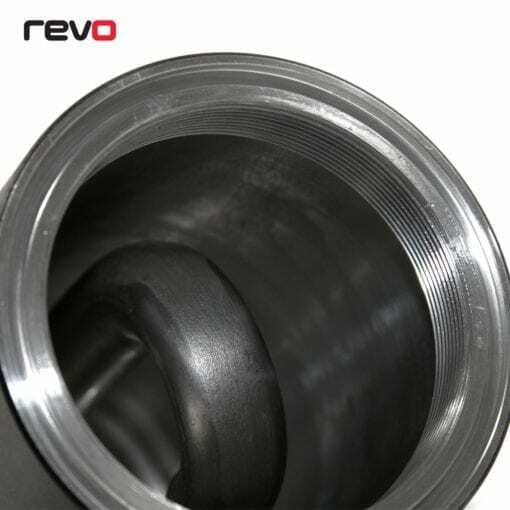 The Audi 3.0T V6 engine is a compact power plant before tuning, with Revo Stage 1+ Software and a Revo Pulley upgrade you can expect to see figures up to 442BHP (415PS, 330KW) and 610NM (450LBFT) of torque throughout the rev-range, transforming an already powerful car. 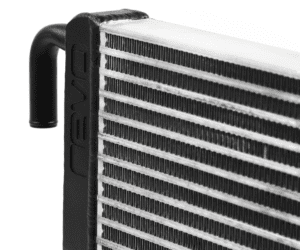 The supercharger on the 3.0T engine shares the coolant system with the rest of the engine, this causes temperatures to rapidly climb when driven at high speed for long periods or in hotter climates, these high temperatures cause the car to reduce power as a safety parameter, resulting in loss of performance. The Revo Charge Cooler System enhances the engines cooling capabilities, giving access to more power for a longer period of time. 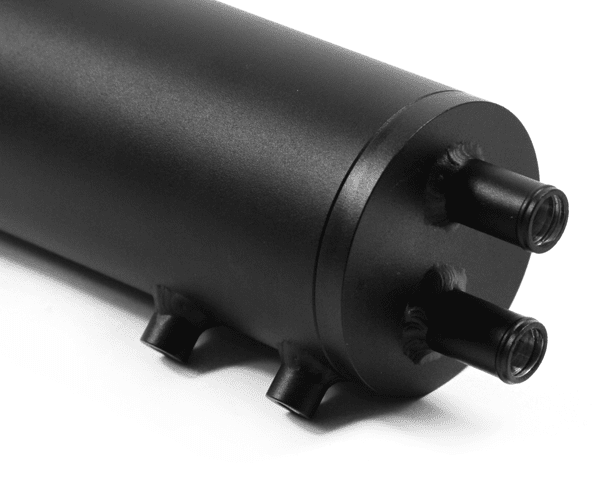 The direct-fit standalone system has unique features that optimise the entire cooling system, a larger heat exchanger, the addition of a dedicated coolant reservoir and custom silicone hoses and fixing brackets. 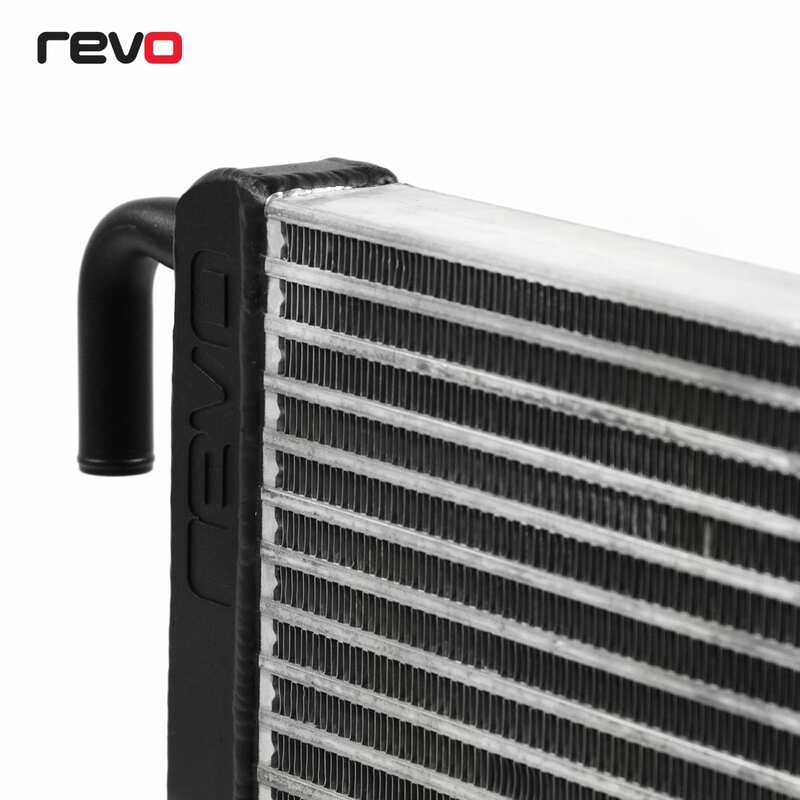 The Revo Charge Cooler System offers more consistent and lower intake temperatures, especially at the top end of the rev range. To achieve more effective cooling, the heat exchanger has a much larger surface area than the OEM part and has over 50% more volume. The increased amount of coolant within the system means it has more to work with, effectively slowing down how quickly the OEM pump needs to move the coolant around and giving it more time to cool in the heat exchanger. 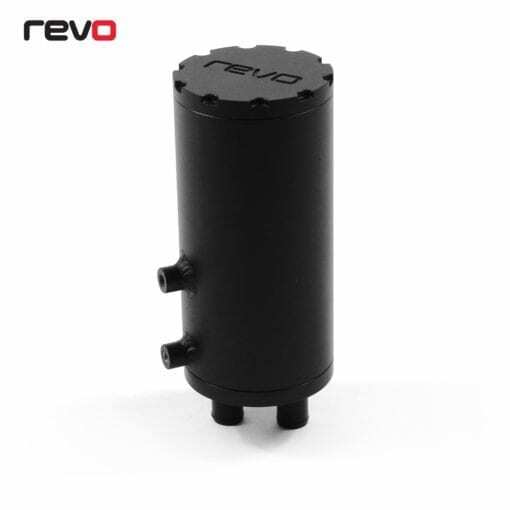 The Revo engineers did not want to only increase the size of the cooler, but to ensure that it operated more proficiently than the stock part. Each end tank has been designed with specifically placed bars that evenly distribute coolant throughout the cooler, allowing more time for it to dissipate heat while in the core. As a standalone system with a dedicated reservoir, the Revo Charge Cooler System operates far more efficiently, introducing more coolant to the system and reducing pressure on the OEM coolant pump. 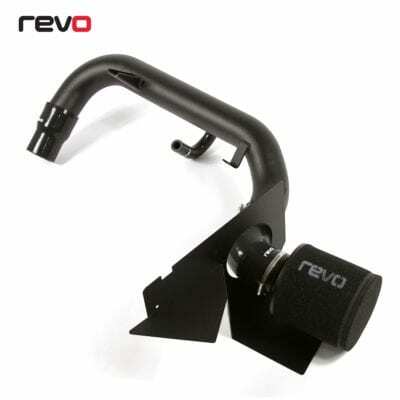 Dedicated to cooling the Supercharger alone, the Revo system also allows the rest of the engine to cool itself more efficiently. The system has been designed with subtlety in mind and will fit directly in to the engine bay without any need for modifying. As well as the brackets and fixings, the Charge Cooler Kit also comes with Cad designed silicone hoses to re-route the coolant. 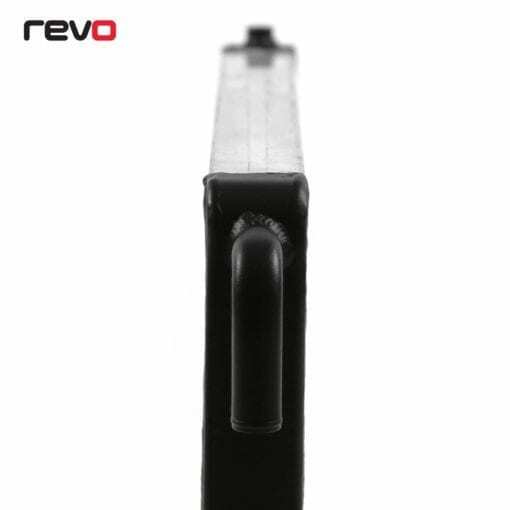 Manufactured using automotive grade silicone and the highest quality polyester fabric, the hoses are built with four plies to ensure optimum strength and reliability. Temperature testing was carried out to ensure that the new Revo system was doing its job. 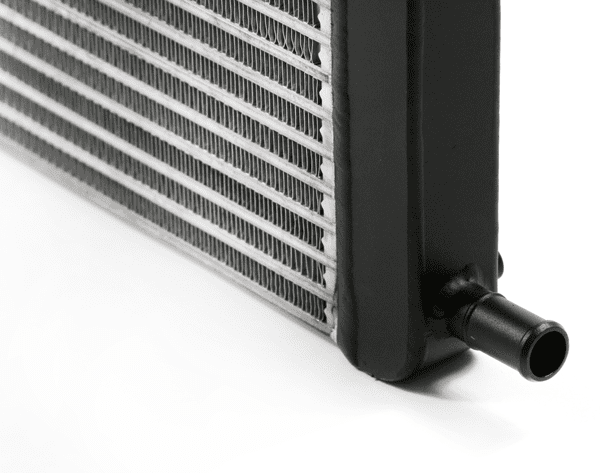 Carrying out consecutive high-speed runs of 0-160mph, the team were able to mimic the extreme scenarios that result in high intake temperatures and subsequently a loss of power. This was done at a private test track rather than on a dyno to ensure airflow was realistic. 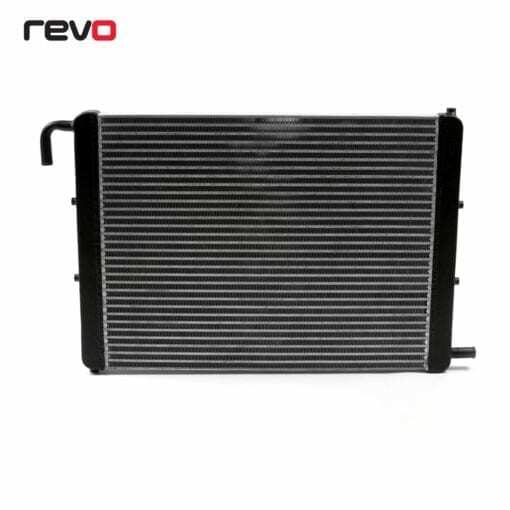 It was also noted that when at normal driving speeds there was a reduction in intake temperatures of between 3-6°C with the Revo charge cooler fitted, compared to the same run with the OE cooler. 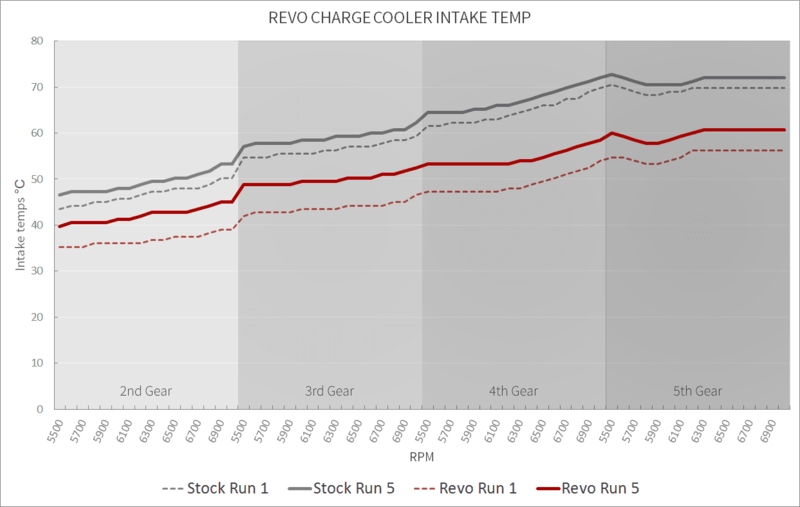 The graph shows the 1st and 5th of 5 back to back runs with both the stock heat exchanger and the Revo Charge Cooling System. Each run was 0-160mph and air temperatures ranged from 17 – 20°C, with the Revo charge cooler system remaining 12° C cooler than the Stock system after the 1st Run.